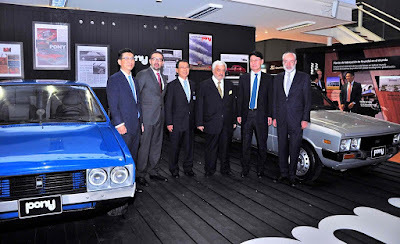 Hyundai Motor is celebrating 40 years of exports to international markets, following a period of significant overseas growth that has seen it become one of the fastest growing brands in the world. From South Korea’s first mass-produced model to the latest generation of eco-friendly cars, more than 23 million Hyundai Motor vehicles have been exported worldwide since 1976. Building on its international export success, Hyundai Motor is now the sixth-largest automotive brand in the world and the 35th biggest brand overall globally, according to the latest rankings by Interbrand. Despite yet another challenging year for the automotive industry, the company’s global brand value grew 11 percent since 2015, reaching US$ 12.6 billion in 2016, securing the Korean company’s place among the biggest brands on the planet. The Hyundai Motor brand is set to achieve even greater heights with the launch of IONIQ - the world’s first vehicle platform to offer three electrified powertrains, making low- to zero-emission mobility accessible to everyone. In 2017, high-performance Hyundai N cars will come to market and the future-mobility focused ‘Project IONIQ’ will continue to push the automotive industry’s boundaries, moving Hyundai Motor into new automotive spaces.